Development Said to Be North America’s Largest Lincoln-Branded Automotive Facility. 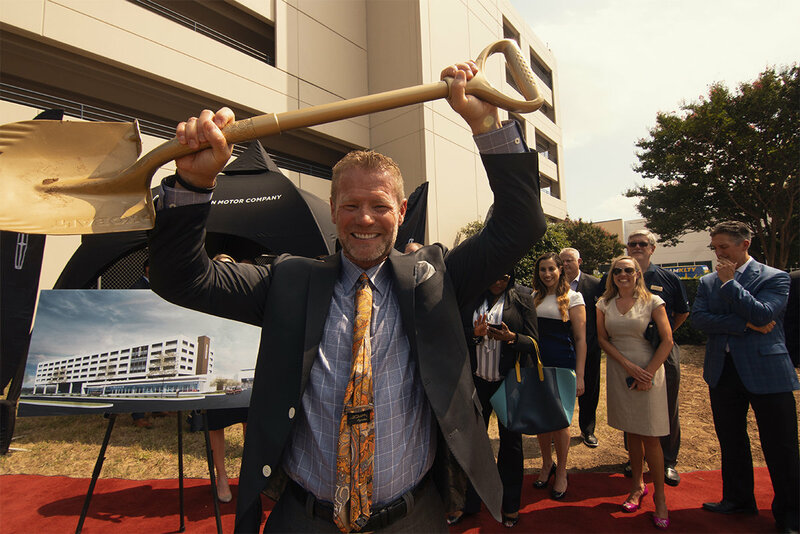 Dallas, TX – Thursday, June 7, 2019 – Randall Reed, owner of World Class Automotive Group, broke ground Tuesday, June 5, on a new mixed-use Lincoln dealership. The luxury dealership will be located at 7777 Lemmon Ave., Dallas, Texas and is part of a 25-acre, $140-million mixed-use redevelopment taking place at the historic former Braniff International Airways facility at Dallas Love Field. The new 267,342-square foot Lincoln dealership will be housed on the same site and adjacent to the iconic building now called the Braniff Centre, which will include the dealership as well as aviation facilities, entertainment venues, and hospitality facilities. Once completed, Mr. Reed’s Dallas Lincoln dealership will be the largest Lincoln-branded automotive structure in North America and include an existing 6-story, 600+ space parking structure. The redevelopment of this site has been a 6-year vision of Reed’s, who is an award-winning Texas automotive dealer and entrepreneur. The entire project transformation has been conducted in partnership with the Texas Historic Commission. "This amazing redevelopment will not only preserve this important piece of Dallas history, but create wonderful business opportunities that will provide incredible services to our local community,” Mr. Reed added. In 2009, Mr. Reed retained Michael Graves, founding partner of The Gravity Company, to develop his vision of the mixed-use redevelopment including the Lincoln dealership. The Gravity Company, in tandem with FRCH Design Worldwide, have worked with the Federal Aviation Administration, Texas Historic Commission, and National Parks Service to secure the approvals needed to meet the guidelines and preservation requirements of the new Braniff Centre. “While updating the structure to serve contemporary uses, it was crucial to keep the original designs of William Pereira and Charles Luckman and retain the spirit of flight, as seen in elements such as the inverted butterfly roof architecture and the glass curtain wall,” said Mr. Graves. This approved project has allowed Mr. Reed to attract development partners including: Lincoln Property Co., Blue Star Land LP, and aviation company The Arnold Companies (TAC). Each have projects that are a part of this master development. The restoration and expansion of the former Braniff building will help restore a portion of the airfield to an earlier time in aviation history and recapture the modern jet-setter lifestyle that was once defined by Braniff International Airways in the ‘50s. Renovations are expected to be completed by summer 2019. Randall Reed’s Park Cities Ford Lincoln is the current site of the Lincoln franchise at 3333 Inwood Road, Dallas. The Ford franchise will remain at that location, its home since 1992. World Class Automotive Group is owned by Randall, Sherry and Shelby Reed. The family-owned business is comprised of multiple award-winning dealerships throughout Texas, including: Park Cities Ford and Lincoln in Dallas, Prestige Ford in Garland, Planet Ford in Spring, Planet Lincoln in Spring and Planet Ford in Humble. Each location has been recognized for outstanding customer service, including the J.D. Power Dealer of Excellence. In addition, the Reed Ford locations achieved a historic first – every location simultaneously earned Ford’s highest honor, the Triple Crown. To learn more, visit ReedHasIt.com. J.D. Power 2018 Dealer of Excellence for the Customer Sales Experience. For J.D. Power award information, visit JDPower.com.